Metallic glasses are unique materials at the cutting edge of materials research. New experiments now show that one can drastically change the nature of these glasses simply by applying pressure instead of by changing the composition. Structural transitions resulting from an increase in atomic coordination have been reported in a variety of amorphous materials, including amorphous ice and silica glass. This has been termed polyamorphism --- the transition from a low-density amorphous form to high-density amorphous form i.e., much as crystals change structure but here there is no ordered crystal structure. 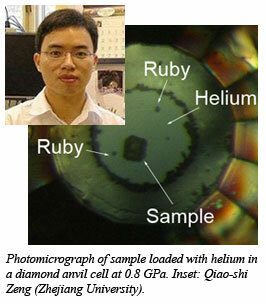 Using a combination of high pressure synchrotron x-ray absorption spectroscopy and diffraction techniques, Qiaoshi Zeng (Zhejiang University) and colleagues from Carnegie and Stanford University report experiments that uncover the origin of the pressure-induced polyamorphism from a low-density amorphous state to high-density amorphous state in this class of materials. 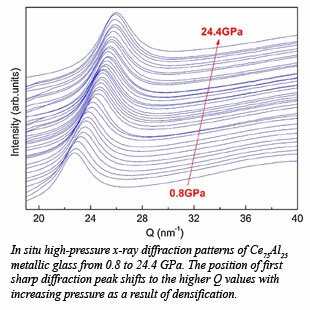 Studying Ce75Al25 metallic glass, they observed the Ce 4f electrons transform from their ambient condition localized state to an itinerant state at high pressure. There is an associated volume collapse of 8.6%, coinciding with the 4f delocalization. This new type of electronic polyamorphism in densely-packed metallic glass is dictated by the Ce constituent, and is distinct from the well-established structural polyamorphism in which densification is caused by coordination change and atomic rearrangement. These results have implications for understanding the behavior of other metallic glasses and is valuable for searching for polyamorphism associated with electronic transitions in other f-electron materials [Q. Zeng et al., Phys. Rev. Lett., 104, 105702 (2010)].